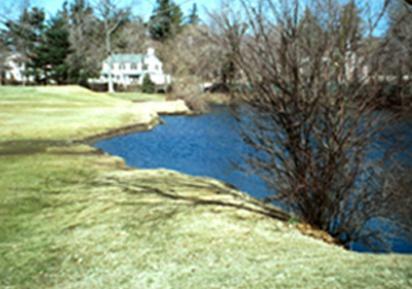 During the revitalization process of Ardsley Country Club, CAMCE provided engineering services to design the retention basins necessary to control the storm water run-off. CAMCE investigated the existing and proposed topography at each of the proposed retention basins in order to evaluate the storm water management requirements for the proposed modifications. Stormwater analyses were performed using HydroCAD software to determine the times of concentration and peak rates for each storm frequency for both the existing and developed conditions at each location. The flows were routed through the ponds to the existing streams by designing the adequate control structures and culverts to drain the storm water volumes adequately while maintaining the peak rates of flow below defined thresholds. Hudson Valley Acres is a proposed subdivision located in the Town of Lloyd. 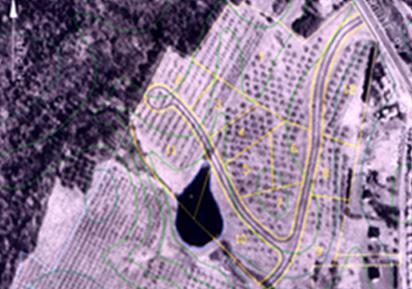 The site was previously utilized as an apple orchard and consists of 59.91 acres. CAMCE was retained by the developer to plan and design the subdivision of the lot and to assist the client in obtaining all the necessary approvals from the governmental agencies. CAMCE subdivided the lot into individual parcels in accordance with the requirements of the Town of Lloyd code, and coordinated with the surveyor. CAMCES performed stormwater drainage calculations for the site and designed necessary appurtenances such as culverts, and drainage easements to drain the stormwater while controlling the peak rates of flow. Lastly, the micro-pool extended detention ponds were designed to aid the exiting pond to maintain/improve the quality and quantity of runoff from the pre-development condition. The Sleepy Hollow Country Club (SHCC) is situated just east of Route 9, within the Village of Briarcliff Manor, Town of Ossining and partly in the Town of Mount Pleasant, New York. The dub consists of an 18-hole golf course, a 9-hole golf course, a practice fairway, tennis courts, a swimming pool, and other facilities. 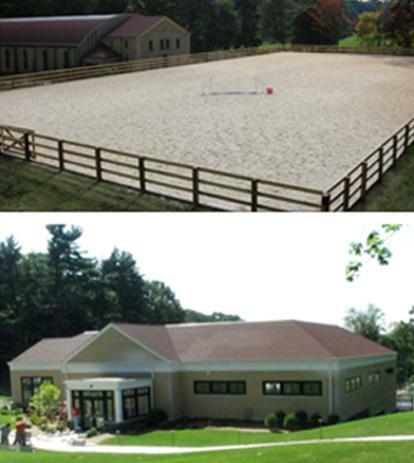 CAMCE was hired by the SHCC to design a Grand Prix size outdoor ring with premium all weather fiber blend dust free footing, including the storm water runoff analysis for the site. The site was re-graded to blend in various access trails, the service road and the connective gravel path from the stable entrance. CAMCE provided a full scope of services for this project, from start to finish, to ensure highest quality end-project. Looking to update its grounds, the SHCC decided to remove an existing one story building and construct a new LEED Gold Qualified squash court building complete with all the associated walkways, grading and landscaping. CAMCE was hired to perform site grading with the associated retaining walls; design an on-site sewer/septic system and other utilities; rehabilitate parking, walkways and paving; landscaping and lighting. This project included the design and construction management for the rehabilitation of large diameter storm drains ranging from 36 to 116-inch diameters, access manhole chambers and spillway structures. The scope of work involved emergency repair to a section of 108-inch diameter storm drain that handles runoff flow from a large portion of the City. The spillway structure acts as a relief overflow chamber for the Molly Ann Brook during high flow periods. The storm drain and access manhole are part of the overall storm drainage system. The work has been performed in several stages, with the last stage currently under design. As part of the design and construction management, we specified numerous types of structural and rehabilitative products, special grouts, epoxy mortars and steel liners. Special pumping systems with the interceptor were required to divert flow in order for the contractor’s to perform the necessary repair work. The City of Paterson requested that we complete an expeditious revised design to repair a portion (Section 2) of the Rossiter Avenue Storm Drain. 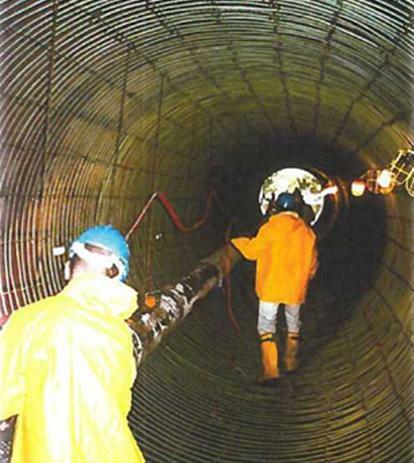 This repair was completed for 200 linear feet of 106-inch to 116-inch diameter tunnel as an emergency due to the deteriorated condition for this portion of the tunnel. To restore the tunnel’s structural integrity a reinforced concrete liner was constructed within the tunnel. Construction services and resident inspection were provided.